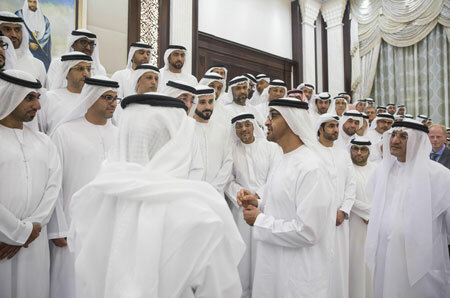 His Highness Sheikh Mohamed bin Zayed Al Nahyan, the Crown Prince of Abu Dhabi and Deputy Supreme Commander of the Armed Forces, attended at His Ramadan Majlis a lecture delivered by Professor Dimitri Christakis. His Highness Sheikh Saud bin Rashid Al Mualla, Member of the Supreme Council and Ruler of Umm Al Quwain also attended the lecture. Professor Christakis dedicated the first part of the lecture to showcasing how the brain develops in the first three years of the child's life, and how experiences undergone in the first few years of our lives shape the development of our brains for years to come. He also discussed the ill effects of overexposing children to different forms of media, including television, which he argued contribute greatly to shortening children's attention span, eventually leading to Attention Deficit Hyperactivity Disorder (ADHD). He said once the children develop the language function between 18 to 24 months they start developing the part of the brain that controls executive functions, particularly self-control, working memory and cognitive flexibility. "All three of these are important, but I believe that self-control is the most important," he said. He said overexposure to fast-paced media negatively affect children's ability to self-control. "Children need real time play and less fast paced media," he said. "If you change the beginning, you change the whole story. "He said the more self-control children have in their childhood, the better they are likely to do as adults, recommending training children to be able to focus on a single task. He said the argument for multitasking doesn't make sense because the performance of children in fact goes down when they multitask while performing a single task produces work of better quality. He said overexposure to television, especially fast-paced media increases the likelihood of children developing ADHD. "Children who watch two hours of TV before the age of three are 20 percent more likely to develop ADHD when they grow up," he said. Professor Christakis said that even overexposure to good content has ill effects, suggesting that parents ensure their children use media in moderation. He said there are alarming figures about the amount of time children spend in front of screens. "A typical child spends six to seven hours a day, so they're spending 50 per cent of their time in front of a screen," he said. He said parents have to model their behavior in front of their children when it comes to using media, arguing that traditionally used to get family members together, which isn't the case anymore as everyone watch TV and other content on their tablets, mobiles and TVs. He suggested that parents should make a diary of how much media and social media is being used in the family and based on this diary one can start moderating their and their family's use of media. Christakis is professor of Pediatrics at the University of Washington. He's also the director of the Center for Child Health, Behavior and Development at Seattle Children's Research Institute, and an attending pediatrician at Seattle Children's Hospital. He graduated from Yale University and the University of Pennsylvania School of Medicine and he's the author of more than 200 original research papers and a book titled ‘The Elephant in the Living Room: Make Television Work for your Kids’. The Ramadan series of lectures is part of His Highness's effort to spread the spirit of knowledge and learning in the United Arab Emirates, by inviting renowned scholars, experts, officials and entrepreneurs to speak at his majlis at Al Bateen Palace in Abu Dhabi. His Highness Sheikh Mohamed bin Zayed Al Nahyan, Crown Prince of Abu Dhabi and Deputy Supreme Commander of the UAE Armed Forces and Chairman of the Abu Dhabi Executive Council, has issued a resolution pertaining to the restructuring of the Abu Dhabi National Exhibitions Company (Adnec) under the chairmanship of Noura Mohammad Hilal Al Kaabi. The resolution also named Saif Saeed Ahmed Ghobash, Mohammed Najm Mohammed Abdul Rahim Al Qubaisi, Dr. Omniyat Mohammed Al Hajeri, Dr. Yousif Al Sheiba Khamis Al Sheryani, Ali Murshed Al Marar and Hareb Mubarak Abdullah Al Muhairi as members. His Highness Sheikh Mohamed bin Zayed Al Nahyan, Crown Prince of Abu Dhabi and Deputy Supreme Commander of the UAE Armed Forces received this evening at Al Bateen Palace a delegation of doctors working in government, military and private health sectors, who were accompanied by the veteran doctors who established medical centres and provided curative services during the early days of federation. Present were Sheikh Hamdan bin Zayed Al Nahyan, Ruler's Representative in the Western Region and Sheikh Mansour bin Zayed Al Nahyan, Deputy Prime Minister and Minister of Presidential Affairs. Sheikh Mohamed exchanged Ramadan greetings with the delegation members. He said that the UAE, under the wise leadership of President His Highness Sheikh Khalifa bin Zayed Al Nahyan, is pressing ahead with the development of the healthcare sectors, according to the highest international standards. He said that a key engine for progress is raising capabilities of human resources in the medical fields through developing skills and experience. He also stressed the importance of partnership among medical institutions and the prominent medical research centres. 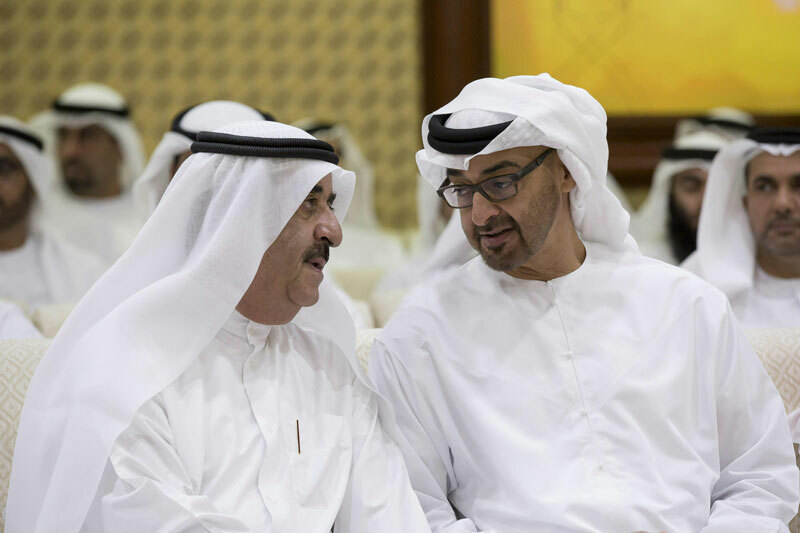 Sheikh Mohamed praised the efforts of the doctors who dedicated their knowledge, skills and expertise to providing medical services in the UAE. He also lauded their efforts in such a noble profession that embodies humanity and mercy. "We realise that the medical field is a very complicated profession and the successful doctors always believe in the great responsibility towards their patients and the need to help alleviate their pains," he said. Sheikh Mohamed said he was confident that the Emiratis are capable of achieving excellence in the medical fields. The meeting was attended by Abdul Rahman bin Mohammad bin Nasser Al Owais, Minister of Health and Prevention, Dr. Mugheer Khamis Al Khuyaili, Chairman of Health Authority- Abu Dhabi (Haad), Humaid Al Qattami, Board Chairman of the Dubai Health Authority, Dr. Maha Barakat, Director General of Haad, Dr. Omniat Al Hajeri, Director of Public Health at HAAD and a number of officials.